Complete BRISA® Gel enhancement services with prep and finish products that ensure proper bonding and longer wearing enhancements. UV-cured bonding agent that securely adheres BRISA® Gel to the natural nail. High-gloss, UV-cured gel top coat that seals and protects gel enhancements. BRISA® Bond and BRISA® Gloss are necessary elements of the BRISA® Gel System. 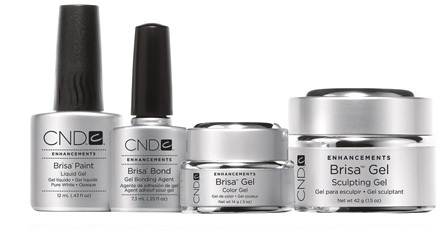 BRISA® Bond is a UV-cured bonding agent that helps adhere gel enhancements and prevent lifting. It forms powerful covalent bonds between gel enhancements and natural nails for superior adhesion. The advanced technology prevents lifting and promotes longer wear. BRISA® Gloss is a high-gloss UV light-cured gel top coat that creates a durable, shiny finish to seal and protect BRISA® gel enhancements. Purchase BRISA® Bond and BRISA® Gloss individually, or find them within our BRISA® Gel Intro Packs.